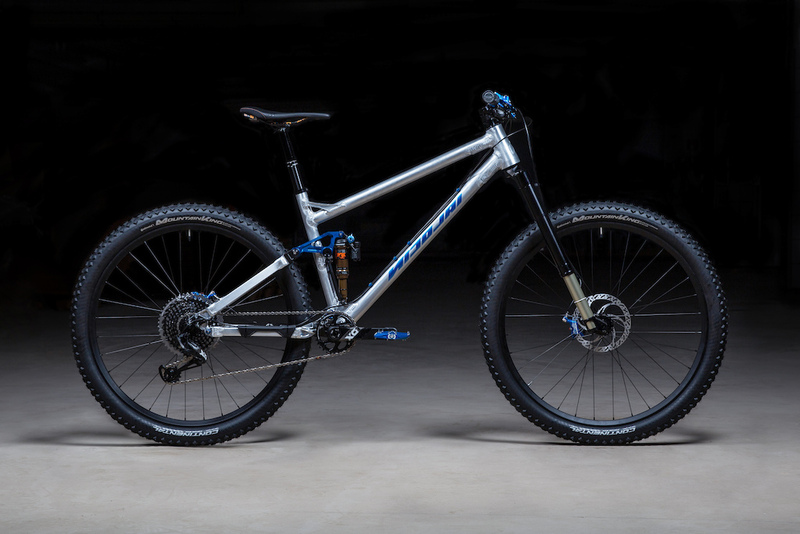 Nicolai's Saturn 14 trail bike brings 140mm of aggressive travel to the trail with either 27.5" or 29" wheels. 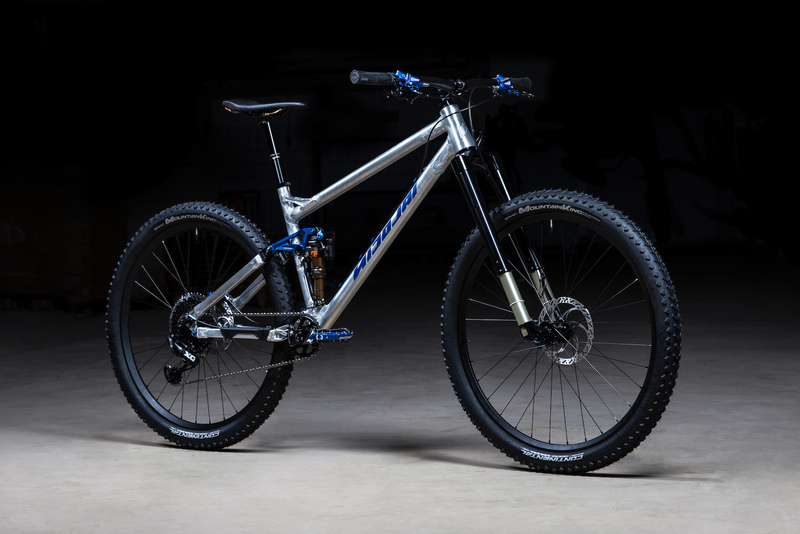 Nicolai's Saturn 14 is the European brand's latest incarnation of the aggressive trail bike. For this bike, Nicolai have combined what they learned with their G13 Geolution chassis with their Saturn 11 to make what they call "an addictively fun bike" that's ideal for a wide range of rides from short after work jaunts to all-day missions in the mountains. It seems that a lot of care was taken in creating this new trail bike. Nicolai's Geolution geometry concept focuses on four different aspects to create their vision of the mountain bike. There's a longer reach, slacker head angle, longer wheelbase, and steeper seat tube angle than what we've long considered standard. The geometry on this bike is less extreme than that found on Nicolai's G1 enduro bike, but still progressive by most any account. Nicolai's bikes are all currently based on their Geolution geometry concept. There are four key components to this concept, according to Nicolai. The longer reach means that all riders, even tall ones, can take advantage of shorter stems without feeling cramped in the cockpit of the bike. The slacker head angles reduce the risk of rolling over the bars. This also improves high-speed stability and wheel grip. Longer wheelbases centralize the rider on the bike and give a more stable ride both climbing and descending and steeper seat tube angles make climbing easier by getting the rider more over the front of the bike and reducing the amount the front wheel wants to 'wander'. 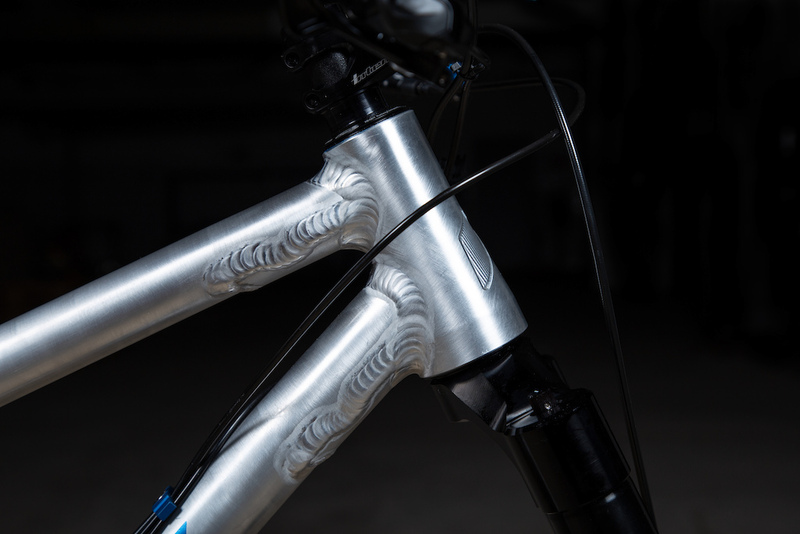 Titanium bolts and custom color options on all of Nicolai's bikes. All sizes of the bike have space for a full-size water bottle and there are ISCG mounts for chain retention systems or a bash guard. The cable routing for the bikes is fully external to aid in easy cable replacement or brake swaps. Also, to keep things as light as possible there are titanium bolts at the Horst Link connection and shock mounts. Custom colors and anodizing are also available for all bikes. The tension bar is intended to reinforces a historically weak area of the frame and allows for the use of lighter tubing without sacrificing durability. 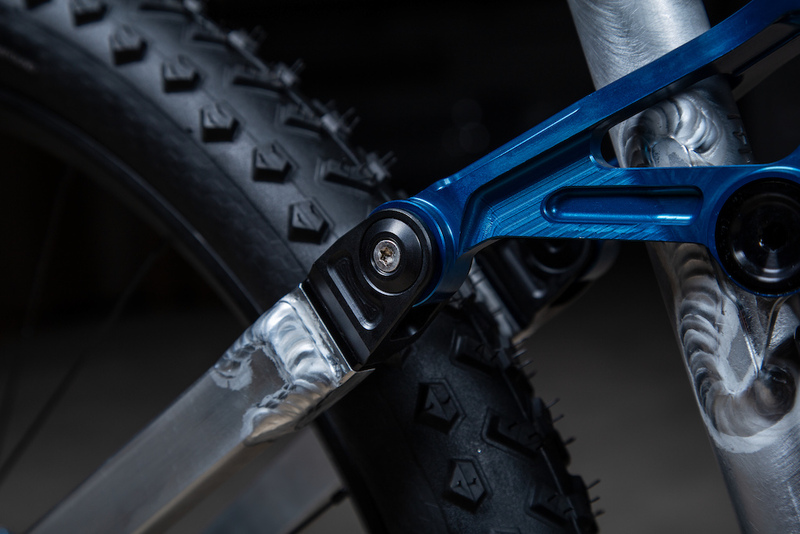 The Saturn 14 also utilizes a tension bar - an extra connection between the lower shock bolt and rocker link. This is to further reinforce the area between those two pivot points, an area of common frame breakage, and allow for lighter tubing and parts to be used in that area, further reducing weight. The Saturn 14 has an adjustable geometry and works with both 27.5" and 29' wheels. 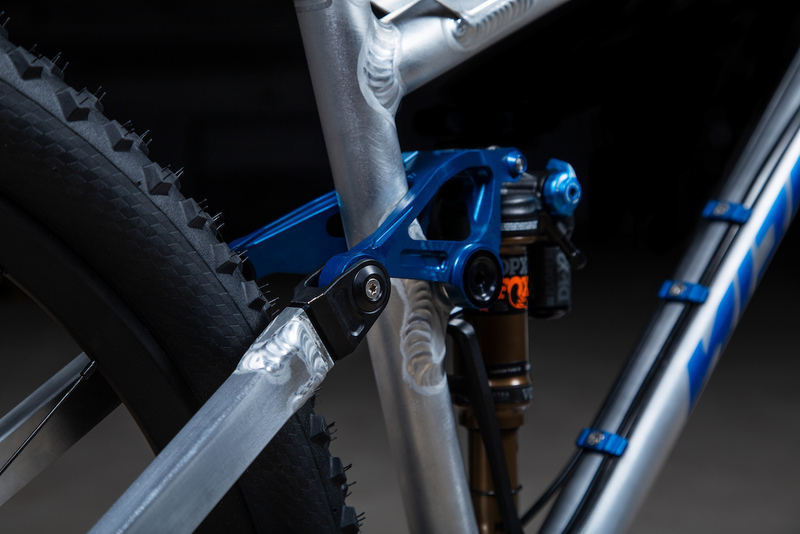 Nicolai's 'Mutator' chips, located on the seat stay and lower headset cups can be changed out to modify stack height and accommodate for the different wheels sizes. 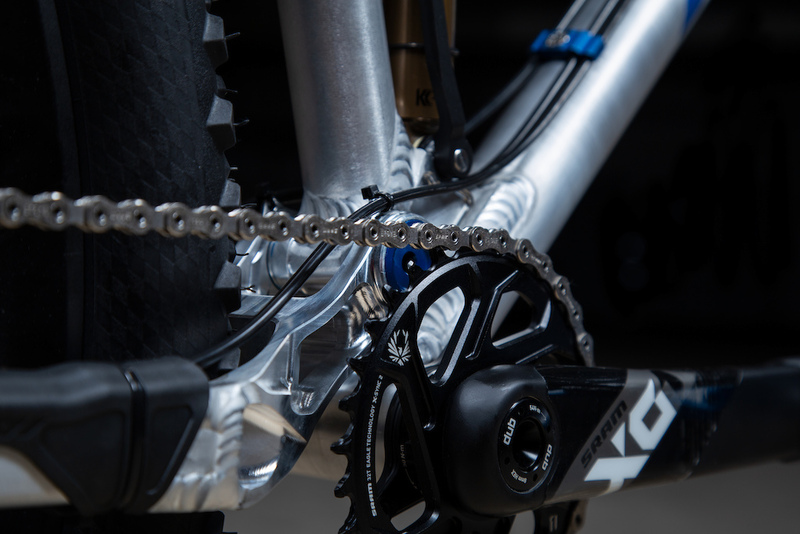 Nicolai have their standard factory geometry settings but the bikes, according to them, have near endless adjustability and they're willing to help riders figure that out if they don't know exactly what they want on their own. 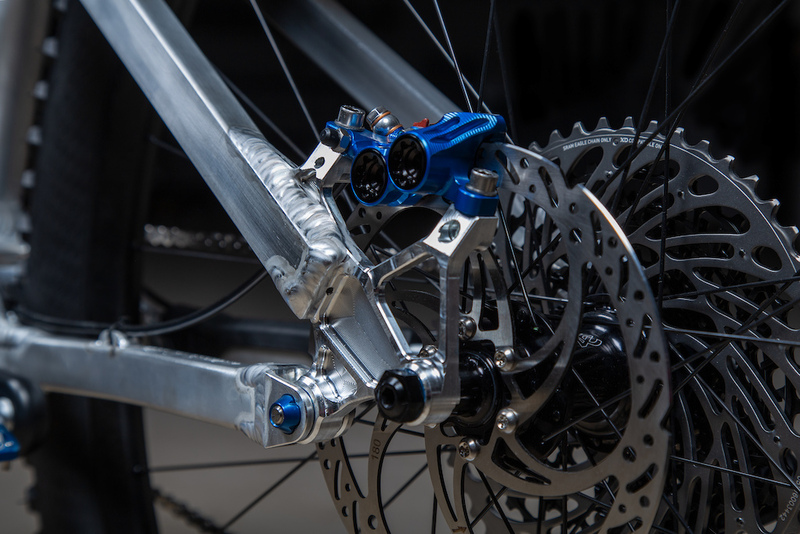 With metric shock sizing, one shock length can offer two different stroke lengths for different travel options: A frame with 27.5" wheels can use either a 201 x 55mm or 210 x 50mm shock to provide 138mm or 130mm of rear wheel travel. If using 29" wheels, only the 201 x 50mm shock, producing 130mm of travel can be used due to tire clearance. The Saturn 14 is available in five sizes, from Small to XXL. This should accommodate riders from 160-205cm, according to Nicolai. The accompanying reach measurements span 450-540mm - pretty stretched out, even by the most progressive of standards. If that doesn't work for you, Nicolai say they will work with riders to produce their own custom 'Tailor-Made' frame, for a surcharge. I don't care how much carbon I look at when I see a beautifully welded raw aluminum frame I just want to take a bite out of it. where are the beautiful welds? @poah: wow.. you got hammered for that opinion. grab yourself a beer bud. And geometry! Oh man let's see those (leverage) curves!! I don't understand the need for this Bike. G1 or nothing.. So I get down rated because I don't understand the reason for this bike? Nice, I saw this bike and could test it two days ago at the Bikepark. I don't bother with it because what do I need this bike when I can have the G1. 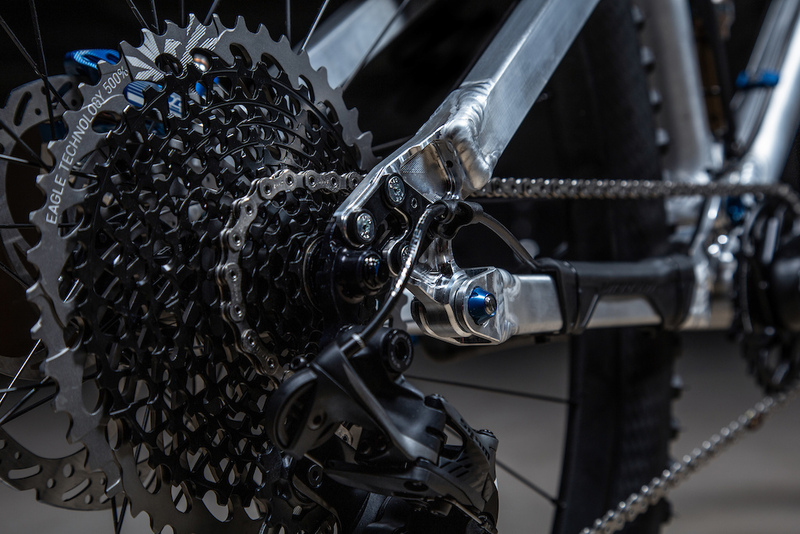 For me personally, I don't see any use for a 100mm travel XC bike but I'm not the only person bikemakers cater to, also it's always cool to see well-made tech stuff. @OhsoGrizzly: I don't understand why you want this bike if you can have a Nicolai G1. @Serpentras: some peops will say the same thing vice versa.. or "don't know why you'd want a Nicolai when you can carbon/steel/titanium or *insertanything*"
Different folks, different strokes.. literally, in this case. @wowbagger: If I see how you can change the G1 from 61,1 to 64,4 ha and all other stuff there is really no need for this. Sure everyone can have it. Still see no point in the Saturn and on the test event yesterday I also saw mostly people interested in the G1. @Serpentras: I have a MOJO G16 29er and I want this bike. I’d strongly consider 63° HTA and 76.5° STA. Or the Robot Bike Co custom frame. @wowbagger: waiting on a coil option. @reverend27: i hear you.. might not be arriving anytime soon though. Cornelius (the guy making them) is a one-man-show i think and for now, he's pretty invested in developing his rear shock (amongst other stuff). I highly recommend following Intend on fb, they're one of the very few sites delivering quality content about their products on there and not just marketing gibberish. @Serpentras: You really don't see the need for this bike ? More seriously, one is a trail bike with 130mm, the other an enduro with 160mm, one weights 2.95, the other 3.60, one has a 1264mm wheelbase, the other 1324mm, etc. Different bikes for different uses. Trail bikes may get burlier, if "the burlier the better" was a universal truth we'd see Shurter on a Ransom. @Will-narayan: there are only two things on the G1 so far I don't like. To less tire clearance for really muddy rides and when you damaged your rear wheel. I maybe order a customized version. I tried the size L, the G1 was riding well and I my actual frame was 65mm shorter in reach. Don't see a problem, not even uphill. Relaxed seat position. @Will-narayan: Where did you find the weight of the frame ? Cannot find it anywhere. What did I miss ? Thanks ! @Fooon: On the website, when you roll over the different frames or bikes, it displays the bike's travel, weight, wheel size and intended use. Surprisingly the difference is bigger for frame only (+-800g) rather than for the whole bike (+-400g). How do you like the welds to be prepared, sir? Extra fat, please. A brace to reinforce a "historically weak" area? why the heck just not use a stronger tube ! ...they didn't think of it. They could have done this quite easy but stronger tubes in this area means - a lot stronger, inculding some not so appealing gussets like their old UFO used... this was their solution to keep the weight as low as possible and to increase durability. Why is it nowadays so akward to you if some one takes a different approach than the rest of the industry? This system is working super well and guaranties a long lasting frame as bikes get ridden harden then ever before. Did no one see this beauty of a fork...? It's not the tube that breaks, it's the weld and pivot that must sustain high shear forces. I think this is a neat design as the shock forces (partly) equilibrate. Alternate solution could be to put the pivot right in the middle of the seattube, but then the seatpost insertion is very limited. 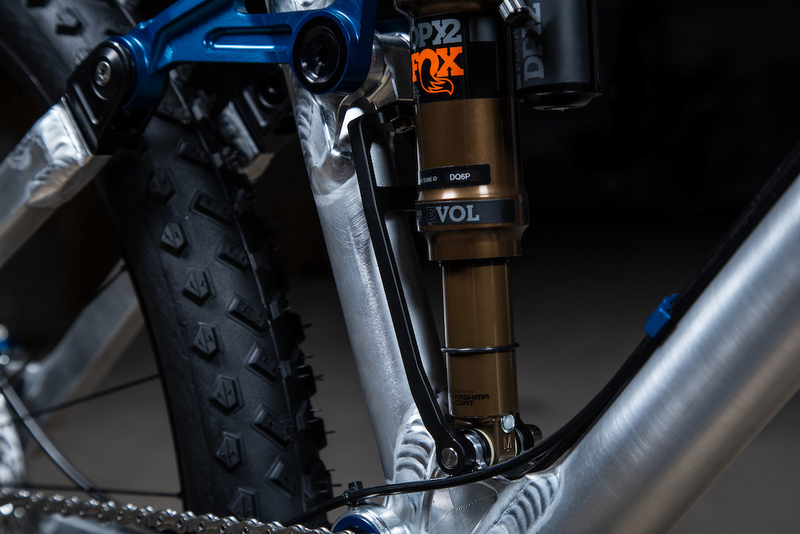 @x-rider: And what about torsional rigidity on that fork? Is it stiffer than old Fox 32? @Loche: This solution also helps to reduce side loading of the shock, reducing suspension bushing wear and allowing for smoother suspension action. @Loche: Um... no. Yeah, the tube might crack on the weld, but it's the tube that's the weak link. The tube is relatively thin and is strong enough to take the force of the seatpost. But the shock puts a high axial stress into it. Use a thicker tube and you have half a meter of thicker tube all the way to the top of the seat tube. This is a very selective strengthening solution. At first i didn't like it, but having it explained like this, it's probably the best solution. I like it! as always love beauty and clean raw bike. Intend BC's new kickstarter "Hero" fork. Sort of a slimmed down version of the Edge, and bsolutely beautiful in every regard. @Zaff: The real question is why Nicolai didn’t use the beautiful blue ano version for this bike? It would have been perfect. Looks like wet weather users are stuck with a frame-mount fender. THIS. This is how a proper mtb should be made. Nothing like a skillfully hand crafted aluminum frame in the raw. So much want!!! This bike is so cool it plays heavy metal on every steep descend. Also looks like a 2019 Nicolai, and you look like a person from 3000 years ago... what's your point? @ctd07: to continue the analogy: that nicolai bikes have not evolved ? @SonofBovril: yeh your analogy is better! Looks like my 2005 turner flux. wheelbase on the medium is crazy! I think it is a typo. Should be 1241mm compared to the other sizes. One thought out loud though, why have you removed the cable routing from the side of the head tube? Mmh indeed, no cable routing on the side of the headtube, but if you look at all their frames that routing is only on frames with a headtube gusset (a few hardtail have a gusset but no cable routing). Nicolai bikes are rad, doubt i will ever buy one but that Saturn sure looks sweet. who doesn't like keloid looking welds? Give me a nice alloy frame over carbon any day. Just made the switch from a carbon to alloy trail bike and I couldn't be happier. This with a pinion box is now the top of the dream bike list. Recommended frame size will look like I’m laying on a tip fuel dragbike with that reach and wheelbase. Since when has 65 deg HA become trail geo? Since their Enduro has 62,5° and if you go crazy with the crazy adjustable frame on the G1 you get 61,1°. With 160mm travel fork. Without headset cups or offset shock mount. why a smaller seat post diameter on xl-xxl? In order maintain stiffness on the seatpost in the larger sizes, where the seat tube length is extended, they use a tube with a larger wall thickness and the same Outer Diameter (I believe for seat stay/linkage clearance it's important that tube is consistent). Naturally the inner diameter shrinks a little if the wall thickness increases. I own two Nicolai's for reference (G13 and G15 GPI), and they did this on both of mine. Aluminium, welds, CNC machining. My type of bike!! Yep.... that sure is hand welded. All that I see is a 90s turner with an inverted fork and 12x.....sick brakes tho! Seat tube is too long on the medium. They will make you one. And I think my 26 Nicolas will outlive me. @Axxe: i just like that 00's industrial design, is a men's bike ???? I know it's not THE cool thing to say on Pinkbike (where you must pretend you are impressed by any attempt at craftsmanship even if you don't get it) - but I don't like the welds. Looks like my messy attempts at using too much silicone sealant round the bath. @bikeisshortforbichael: I did see how they weld two days ago. Absolutely not true what op thinks. Who cares! The raw rugged strong construction of this frame is what matters not ultimate asthetics. Give me this bike over a pretty carbon frame anytime!! because the stamina is Glued/bolted dummy. Apples to Oranges ?? @viatch: Why can't fruit be compared? @gotohe11carolina: So we don’t go bananas. The geo looks spot on but the bike is a bit ugly. I'd ride it. way too big. 450 reach on a small.